Servicing the greater Tampabay area including Tampa, Clearwater, Dunedin, Safety Harbor, Belair, Largo, Indian Shores, St. Petersburg, Palm Harbor, Tarpon Springs, New Port Richey, Holiday, Trinity,Citrus Park, West chase, Town N Country and all other areas around mid Florida. We will come to your home. Measure or template the area you need furnished. Take these specs back to the shop and build you a custom piece of furniture to fill the spec. In the featured picture there were constraints that just could not be done by mass-produced furniture. So we filled the need and the client is very happy with their new sectional that both fills wall to wall but is built around a post in the corner that is unseen in this picture. 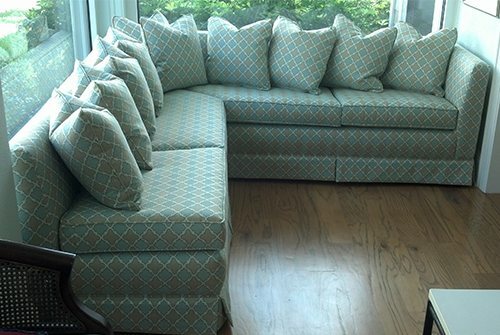 We also build custom cornices, ottomans, headboards, and whatever your furnishing needs may be, give us a call or email and lets get working. Full service. From the frame to the upholstery we take care of it all. Keep that special piece alive. Some things just can’t be replaced.